Every time I do a literature search for Omega 3 fatty acids there are new studies finding their important role in protecting our hearts and brains. These anti-inflammatory fats were critical in our diets for the many centuries of human existence and yet have declined in western diets. As we live with the consequences — poor heart health, increased levels of depression, and a rise in diseases of inflammation in general — many of us scramble to add this important fat to our diet. One big problem is that our world is filled with an Omega 3 competitor: Omega 6 fatty acids. When we eat them both, they fight for a place in our cells and Omega 6s tend to win out. Considering the extreme amount of Omega 6 in the standard American diet (in the form of vegetable oils in particular), our bodies are overloaded with this fat and deficient in Omega 3s. We must improve our ratio of Omega 6s to Omega 3s (down to a ratio of 4 to 1 or better) which means loading up on Omega 3s. Fish and seafood provide the best sources of Omega 3s but nuts and seeds can be good options for those who cannot eat fish and seafood. By far, the most abundant source of Omega 3 fatty acids is found swimming in our oceans or freshwater rivers and lakes. 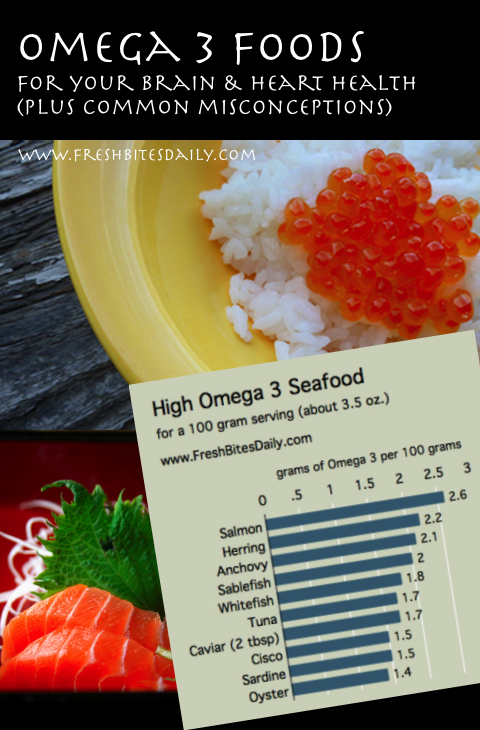 Fish and other seafood tend to be high in Omega 3 fats and low in their competing Omega 6. 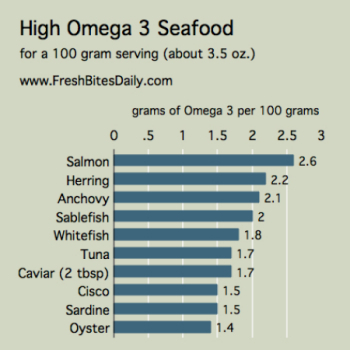 In the graph here I provide a “Top Ten” list of seafood and fish packed with Omega 3. The data comes from the USDA’s impressive nutrient database project and can give us a good example of fish to reach for in the market. However, these data are simply averages of many data points (in most cases). Your mileage may vary depending on the food that you buy. 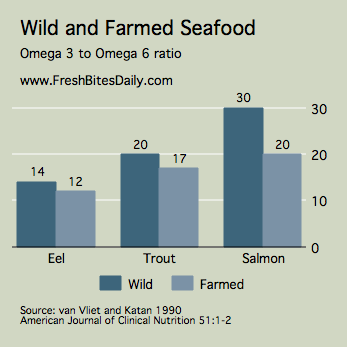 As a rule of thumb, wild raised and caught food is higher in Omega 3s. The diets of farmed fish tend to be high in Omega 6 fats and the fish incorporate those fats into their flesh. One study of farmed versus wild fish tells the story pretty well. As it turns out, farmed fish also tends to be higher in toxins and is an inferior choice if you are lucky enough to have the bucks to make such a choice at the market. It lists species of wild Alaskan salmon as “best choice” (here). This is our favorite online source (here), a partner of this website whom we have purchased from for about a decade. There are concerns that Atlantic herring is being overfished, which may impact marine mammals, seabirds and fishes that also depend on this species. It lists Atlantic and Lake herring as “good alternative” (here). Sablefish from Alaska and British Columbia is a “Best Choice” and is certified sustainable to the standard of the Marine Stewardship Council (MSC). It lists wild caught Alaskan and Canadian Pacific sablefish as “best choice” (here). Great Lakes populations of lake whitefish were reduced in the mid-1900s by overfishing, habitat damage and the introduction of non-native species. Today, the species has recovered and is a “Best Choice” from Lake Superior and Lake Huron, and from Lake Michigan when caught by trap net. Find the whitefish guide here. Albacore tuna is found in most of the world’s oceans. Many types of gear are used to catch tuna. Trolls and poles are the most ocean-friendly options. Some albacore tuna is certified as sustainable to the standard of the Marine Stewardship Council (MSC). It lists U.S. Pacific and Canadian Pacific albacore as a “best choice” (here). This is our favorite online source (here), a partner of this website whom we have purchased from for about a decade. Many populations of Atlantic sardines in the Mediterranean are declining due to overfishing. This, and ineffective fishery management, result in an “Avoid” ranking. It lists U.S. wild caught sardines as a “best choice” (here). If you are looking for a vegetarian form of Omega 3 fatty acids, nuts and seeds do have ALA — alpha-linolenic acid. Our bodies metabolize this plant-based Omega 3 and turn it into the longer-chain fat found in fish, the form of Omega 3 that has the most direct and beneficial impact on our health. Because of the extra step in metabolizing the fat, your mileage may vary with relying on plant-based ALA for your Omega 3 content. Each of these foods will help with your Omega 3 to 6 balance. A great use of plant-based Omega 3s for vegetarians and omnivores alike is in replacing unhealthy Omega 6 oils with healthier Omega 3 versions. Salad dressing is a great case in point. High Omega 3 flax seed oil along with Omega 9 olive oil makes a great base for a salad dressing. Hemp and chia oil may work well too with olive oil but I have not tried them myself. With each of these oils, be sure to keep them in the refrigerator to protect them from oxidation. “Grass fed beef has as much Omega 3 as farmed salmon (or even wild salmon).” This misconception appears to stem from the beneficial Omega 3 to Omega 6 ratio in beef from cattle raised and finished on grass. 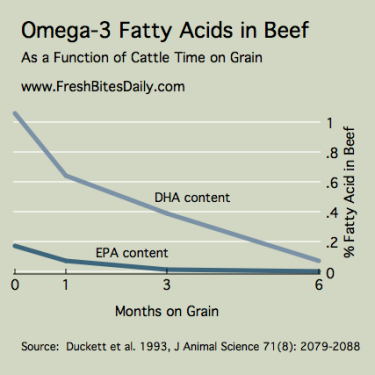 As cattle is finished on grain, Omega 6 in its fat replaces the Omega 3. This fact definitely makes grass fed beef a better choice than grain fed beef in the Omega 3 battle. However, as you savor your wild salmon next time you are able, take note of the fat content on your palate. The juicy goodness is from the very high fat in this fish. Grass-finished beef is low enough in fat that you have to take care not to turn it into shoe leather. It cannot compete with the actual quantity of Omega 3s in salmon. “Farmed salmon is loaded with Omega 6s.” It is true that farmed salmon has higher levels of Omega 6 fatty acids than wild salmon, but it still has a better balance of these fats than most of the grain-based foods and oils we eat. “Don’t worry about mercury in fish because the selenium in fish protects against mercury toxicity.” This claim is based on little research and compares mercury and selenium levels in fish. My concern with the claim (besides the lack of research) is the use of nutrient levels as a key tool — the nutrient levels in this post, on this website, and across the Internet are based on averages of tens or hundreds of food samples typically with a large distribution of actual values. That is, a particular piece of fish may or may not mirror well the average fish in these studies. You could have a source of high mercury fish with low selenium content and realize it only when you end up mercury-toxic. I would exercise caution with fish purchases and follow the recommendations of Seafood Watch listed above and government warnings on dietary fish. “Coconut oil is a good source of Omega 3 fatty acids.” Coconut oil is low in both Omega 3s and Omega 6s, making it a neutral oil in this context. I like to bake with it rather than with an Omega 6 fat and, in that sense, it helps my Omega 3 to 6 ratio but not because it contains any Omega 3 to speak of.